I am very passionate about giving couples encouragement during their engagement to prepare them not only for their weddings, but also for marriage. And this wedding budget thing is a hot topic, so I want to approach it from a slightly different angle. 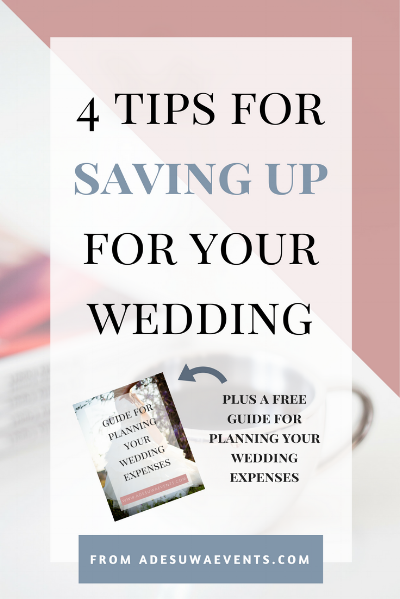 I want to give you a few tips on how you can begin to save up for your wedding. As I discussed in my previous post “6 Ways to Have a Debt Free Wedding,” marriage, on its own, is a huge transition for most people; and the first year is hard enough without adding the burden of debt from your wedding. So, my hope is that these tips will give you a road map so that you don’t take out loans or go into credit card debt to cover your wedding expenses. Let’s be real, most people that are in serious relationships have discussed whether marriage is in their future. So, when this is a strong possibility, it’s the perfect time to really begin thinking about how you will cover your wedding expenses. Now, I don’t suggest that you start saving for a wedding if it’s not likely that you will be engaged fairly soon (within 6 months or so). It would be wise for you to focus on other financial responsibilities instead. So, if you have debts that need to be paid off or other savings goals that are more important, you should definitely take care of those things first. This recommendation of saving for your wedding before you are asked that special question is for those of you who are in long term, committed relationships where marriage is actually on the table (not wishful thinking). It’s for those of you if you and your partner have gone ring shopping or discussed wedding and marriage desires, so you know that a proposal is on the horizon pretty soon. So, for the sake of this post, we will focus on the two situations where you would either be contributing to or paying for your wedding expenses yourself (and when I say yourself, I mean you and your partner). Before you can attempt to start saving for your wedding, you really need to know the numbers in your personal finances. What does this mean? You have to know how much money is coming in every month and how much money is going out. First thing you will need to do is know exactly what your income is every month. How much money are you actually bringing in? Without knowing this before you start, it will be impossible to remain consistent in your savings goal. Next, you will need to pin point exactly what your NECESSITIES are (the things you absolutely need) and how much each costs every month (i.e. mortgage/rent, utilities, food, and transportation). Everything else really are just luxuries. Lastly, you need to make sure that you are paying the minimum payments on any debts that you may have. If you are debt free, then this doesn’t apply to you. But if you have any loans or debts (student loans, car loans, personal loans, mortgage payments, etc. ), the minimum payments must be included as a monthly expense. Once you know how much money is coming in (your income) and how much is going out (your expenses and debt payments), what’s remaining is what you have left to save towards your future wedding. This may be the hardest part of this process but, it is an absolute must if you are serious about saving for your wedding. You may not be willing to go down to the bare bones and completely cut out all of your luxuries, but it would be wise to consider cutting out a few (for example, cable/Netflix, expensive dinner with friends and shopping sprees). Remember, this won’t be a permanent situation. The more you sacrifice now, the sooner you will be able to reach your savings goal. Now, some of you may be in a situation where you don’t have much room left in your personal budget to save for your wedding after paying your monthly expenses and debt payments. And if you are in this situation, I recommend earning some extra income. This can have a few different meanings. You can pick up extra shifts at your current job, get a part time job doing something different, or even start a side business. Now I’m not talking about starting a side business where you shell out hundreds or thousands of dollars to get started. I’m talking about using your talents and skills with materials you already own and going out making some extra money. That could look like cleaning houses, babysitting, or tutoring. The purpose is to make some additional income and save everything you make to go towards your wedding savings goal. You will be amazed at how fast those dollars add up when they aren’t being spent on other things. I will be the first person to tell you that this savings exercise will not be easy. You will have to make sacrifices and you may feel the urge to want to quit or give up. But try to remember why you are doing this. Your reason for going through this has to be more important than the stuff you’re temporarily giving up. There is a proposal on the horizon for you. I’m sure you already have a few ideas of things you would like to incorporate into your wedding day. So how wonderful would it be to know that when it’s time to start planning your wedding, you have a nice chunk of money already set aside for your wedding expenses? You would still, more than likely, need to continue along this track of saving after you are engaged to reach your goal, but it’s always better to get started sooner rather than later. The beauty about starting this savings practice a few months before your engagement is twofold. Not only will you be on the right path to getting your financial act in order for your wedding, but you will also be building up your savings muscle which will propel you forward in your marriage. This journey will open up a line of communication between you and your partner that will allow you to bypass what so many other couples struggle to fight through. You will have the discipline to save up for the things that you want rather than relying on loans or debt. You will also be more strategic and careful in your purchasing decisions because you know how much you sacrificed to save up for them. GIVE THESE TIPS A TRY; I PROMISE, YOU WILL NOT REGRET IT. REMEMBER, THIS SACRIFICE IS TEMPORARY BUT THE RESULTS WILL LAST A LIFETIME.